Enter campus at the intersection of Hilgard Ave. and Westholme Ave. Immediately on your right will be a Parking & Information Kiosk. Proceed to the Kiosk to purchase a parking permit for Parking Structure 2. The rate is $12 per day, cash only. Once you park, consult the map below for walking directions. Please note, this Parking & Information Kiosk may not be open on weekends. Please see below or consult the program webpage for instructions. On weekends and evenings, as well as for short visits, “pay-by-space” permits can be purchased at the automatic self-parking “kiosks” on Level 1 within Parking Structure 2. The rates there are $3 per hour for the first 2 hours, then $12 for the day ($8 on weekends). Cash, debit and credit cards are accepted. Please read all posted signs to avoid receiving a parking citation. If you are taking a taxi, please give the driver this address: UCLA Faculty Center, 480 Charles E. Young Dr. East. The Faculty Center is just north of the Parking Kiosk. Consult the map below for walking directions from there. Enter your starting point for walking directions to IPAM, which is in the Portola Plaza Building. We hold opening day of long programs at Temescal Gateway Park in Pacific Palisades. Once you enter the park, you will find parking in about 50 yards. The stop sign is equipped with a camera, so take care to stop completely. 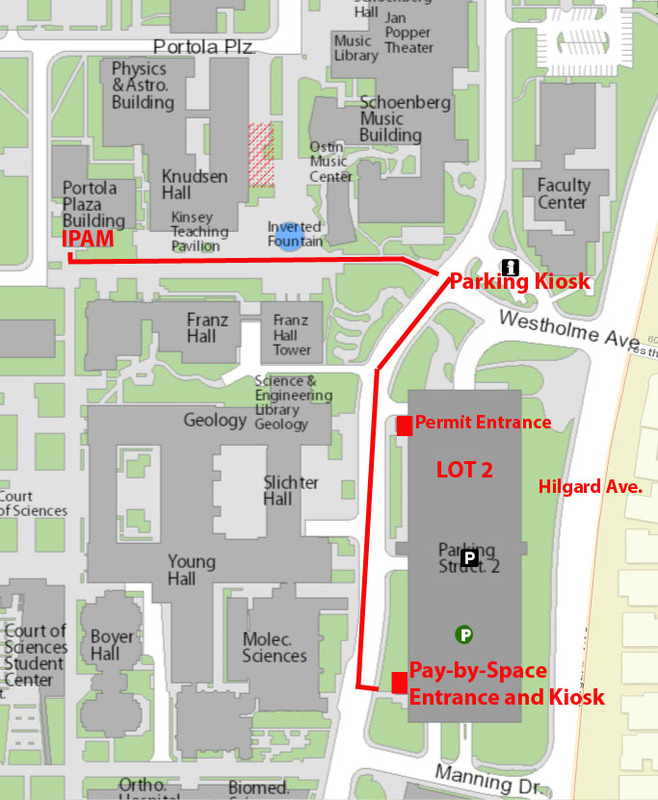 Your Program Coordinator will be there to give you a parking pass and show you where to park. Once on foot, continue walking up the road past the parking area to Stewart Hall. IPAM holds conferences at UCLA’s Lake Arrowhead Conference Center near San Bernardino twice a year. Please consult the Lake Arrowhead Conference Center webpage for directions.